With March over for another year, we thought it wise to take a break from our rampant hot cross bun eating to reflect on the Aussie dollars performance over the month. While we’re on the topic… Easter is only TWO weeks away people! That means only two weeks before the buns are out and all the eggs are half price. Hop to it. It was a traumatic month for the little Aussie battler, fighting through the impacts of the US/China trade wars, a slowing Chinese economy, the ongoing snore-inducing saga that is Brexit and, to top off the month, the inversion of both the US and Aussie bond yield curves - more on that later though. With this in mind, here is the AUD’s scoreboard for March. 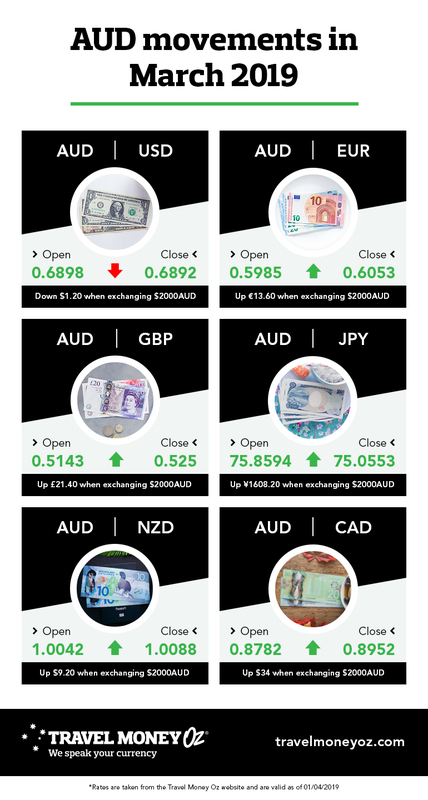 Despite finishing down against the USD and JPY, it finished with gains against the EUR, GBP, NZD and CAD. The start of March saw the AUD take a bit of a tumble as the US recorded a Q4 GDP growth rate of 2.6% that exceeded market expectations, as well as slowing economic growth in China as signalled by contracting manufacturing figures. President Trump and Korean Leader Kim Jong Un were also undertaking negotiations in Vietnam. The bromance seemed to be flourishing until they abruptly cancelled lunch and finished talks. Relations between the two countries seem to be fine, however, this did put a dampener on the value of the AUD. The week started off pretty slowly. It was revealed that the China Shanghai Composite Stock Market index had risen from 2,500 to 3,028 index points for far this year. This meant they were now trading at the same levels seen in June 2018, which was a massive positive that was reflected in some upward pressure on the Aussie Dollar. The Reserve Bank of Australia also kept interest rates on hold which was widely expected by markets. As the week came to a close, the AUD had to work hard to keep its head above water. The key anchor holding it down was the release of Australian domestic data that showed slowing economic and GDP growth. This slowing is reflective of a number of issues that continue to impact Aussie consumers including the slowdown in residential construction, falling residential sales, the continued effects of drought on farmers and the negative wealth effect. This week also saw the European Central Bank keep interest rates on hold, with word that there wouldn’t be an increase before 2020, as well as China’s ‘two sessions’ meetings. After an abysmal end to the prior week, mid-March gave the AUD a much-needed leg up. The start of the week saw market risk appetite improve as a result of better than anticipated January retail sales numbers in the US. The remainder of the week’s market movements were heavily impacted by Brexit. British MPs held a series of votes deciding on the next course of action. These votes covered Theresa May’s withdrawal agreement (it was defeated for the second time), ruling out a no-deal and extending Article 50. The votes had quite a tumultuous effect on the value of the AUD against the GBP. Expectations of the Federal Open Market Committee's (FOMC) reduction of the US GDP forecasts and interest rate rises dominated headlines at the beginning of the week. This was good news for Aussie travellers, as less interest rate rises in other countries reduce the amount of downward pressure on the AUD. These rumours were confirmed by the close of the week, as the Fed seemingly abandoned their plans to increase interest rates in the United States as a result of their slowing economy. They said economic slowdown also warranted a pause in the unwinding of their balance sheet. European Union members also met and approved an extension of Brexit until May 22 if Prime Minister May’s withdrawal agreement was voted in by the end of March. If it wasn’t approved the extension would only be until April 12. The final week of March was perhaps the most volatile. The start of the week saw the US bond yield curve invert for the first time since 2007 - an inversion that signalled the beginning of an 18-month recession. This news caused markets to predict a 60% chance of a US interest rate cut by December 2019. All of this was positive news for the Aussie Dollar. As the week progressed we also saw the inversion of the Australian bond yield curve. Whilst the implications aren’t quite as traumatic as they are for the USA, the inverted Aussie curve is a good indicator of an interest rate decrease, which isn’t so great for the value of the Aussie dollar. This week also the original Brexit deadline of March 29 role around. MP’s held a number of indicative votes to try and find a majority in the house. Eight votes were held and none gained a majority. Theresa May then put part one of her Withdrawel agreement to MPs to vote on again in the hope that it would be passed in order to secure the May 22nd extension. As expected, the deal was voted down for the third time, leaving Britain in a bit of a pickle with no idea of how the Brexit proceedings will continue. This refers to changes in investment activity based on the level of risk tolerance in the market. If the risk is perceived to be low (risk-on) the theory states that investors are more willing to engage in higher-risk investments. Likewise, when the risk is perceived to be high (risk-off), investors will seek lower-risk investments. The Aussie dollar is considered to be a higher-risk investment, so it’s value will generally increase during risk-on moods when risk appetite is high.